A light Christmas starter option that is packed full of flavour. 2. Place the beetroot, parsnips and onion in a roasting dish. Drizzle with the oil and roast in the oven for 20 minutes. Place the hake fillets on a separate baking tray, season with a pinch of salt and pepper and roast for 20 minutes. 3. Meanwhile, cut the kale leaves into bite-sized pieces and place in a bowl with the grated carrot, sliced pear and finely chopped broccoli. 4. Whisk all the dressing ingredients together, then pour over the vegetables in the bowl and lightly toss together. Add the roasted vegetables and toss again to combine. 5. 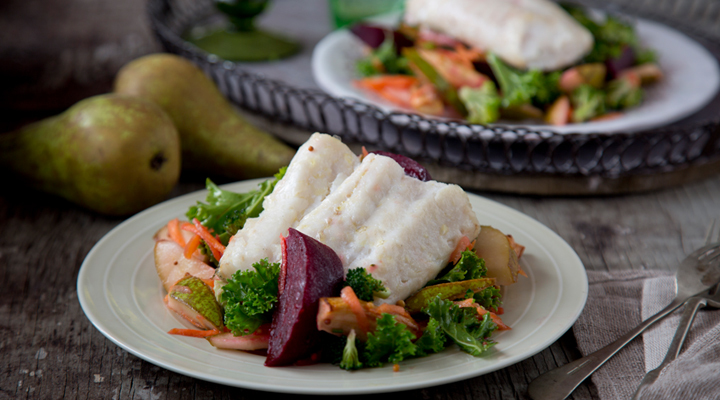 To serve, divide the salad between two plates and top each one with a hake fillet.